Former World DH Champ Danny Hart and veteran South African champion Andrew Neethling are departing Giant’s World Cup DH squad next year, which will be led by Colombian Marcelo Gutierrez and newcomer Alex Marin, a 17-year-old from Spain. Gutierrez, 24, won his fifth Colombian downhill national championship two weeks ago, capping a strong 2014 season in which he ended ranked 14th in the world and earned the "King of Crankworx" title at Crankworx Whistler. "I'm looking forward to continuing my progression with the team next year and stoked to be wearing the colors of my Colombian national jersey again," said Gutierrez who regained his title earlier this month after he missed out the previous year following a crash. Five-time Colombian national downhill champion Marcelo Gutierrez is aiming for a top-10 World Cup DH ranking next year. Alex Marin joins Gutierrez on the DH team. The 17-year-old Spaniard has a handful of podiums and wins at the World Cup and national level in the junior ranks. 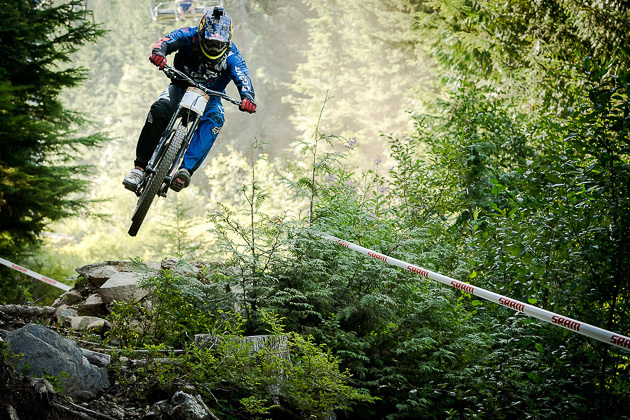 A third up-and-coming rider will be announced in early 2015 to round out the downhill squad. Hart, who was DH World Champion in 2011, and Neethling, will depart the Off-Road team next year. "Danny Hart and Andrew Neethling have been vital in our progression as a team, whether it's on the racecourse or in product development," said Giant global marketing director An Le. "Needles brought experience, speed, style and a positive vibe. And Danny evolved from a teenager with raw talent into a world champion through our program. We've had a great run together and are super grateful for Danny and Andrew's contributions the past few years. Our 2015 direction aligns with our team mission of building future champions through our system and cutting-edge products, and we're looking forward to taking this young DH squad to the next level in 2015." 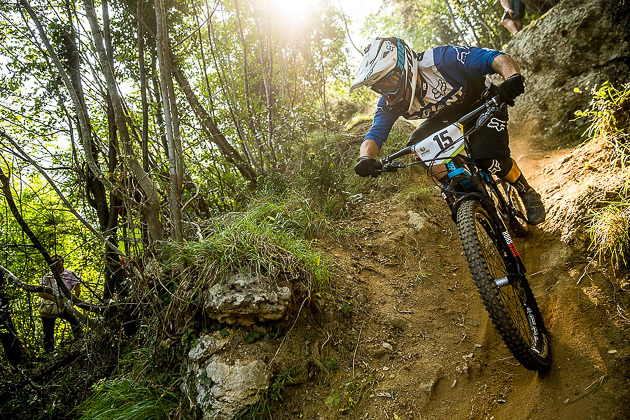 The team's enduro lineup will be led by Frenchman Yoann Barelli. This year, his first with the team, Barelli had two top-five finishes in the Enduro World Series, with his best performance coming at the last round in Finale Ligure, Italy, earlier this month. The 29-year-old won two stages at the finals and finished fifth for the weekend, securing a top-10 overall season ranking. "I was 2.5 seconds from the podium in Italy, and just 14 seconds away from the win," Barelli said. "That's my motivation to train all winter long." Yoann Barelli returns to Giant’s Enduro World Series squad for his second season in 2015. Joining Barelli on the enduro squad will be Australian Josh Carlson and American Adam Craig. Both had some strong individual race and stage performances this year, and will look to move up the rankings in 2015. Beyond the global riders, next year's team also includes American XC and enduro racer Carl Decker. The veteran from Bend, Oregon, won his fifth Downieville All-Mountain world championship this year and will continue to focus on a variety of enduro, XC and cyclocross events in 2015. And Seamus Powell, a 24-year-old two-time U.S. Super D national champion, joins the team as a U.S. development rider. While Decker and Powell will race some XC events, Giant has ended its sponsorship of the XC World Cup-focused Giant Pro XC Team for 2015 to focus its support on the Giant Factory Off-Road Team. All of the Giant Factory Off-Road Team riders will have a full quiver of bikes to choose from including Glory 27.5 downhill bikes, Reign Advanced 27.5 enduro machines, Trance Advanced 27.5 trail bikes and Anthem Advanced 27.5 and XtC Advanced SL 27.5 XC bikes. Full details on the 2015 Giant Factory Off-Road Team, including the final rider lineup as well as partners and sponsors, will be announced in January. To follow the team throughout the year, go to facebook.com/giantfactoryteam.